traction on ice and snow-covered pavement and gravel. driveway become much safer and more enjoyable. The Ice Cleats Rolls up nicely and is small enough to be carried in a work bag. 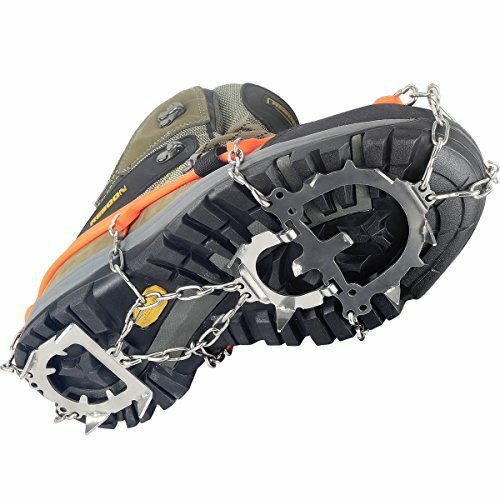 STAINLESS STEEL SPIKES:These ice cleats with 12 High-strength stainless steel spikes, will not rust and would more firm and durable. WELDING CHAIN:The link of this crampon use welding chain and more stronger stainless steel chain. EASY TO WEAR AND CARRY EASILY:This ice grippers fit easily and securely over your own shoes or boots and fold small enough to keep in a pack,or in your car. MULTIPLE USES:Suitable not only for outdoor Ice And Snow, but also for the city to use during the snowy weather, particularly suitable for the elder and kids. reduce the Risk of jnjury from slips and falls when walk on Ice, Snow, mud and wet grass or other poor conditions. 90 Days 100% Satisfaction Guarantee:If you are not 100% satisfied with this product for any reason, please contact customer service within 90 days, and we will refund your purchase price or replace it with a new pair - no questions asked. If you have any questions about this product by YUEDGE, contact us by completing and submitting the form below. If you are looking for a specif part number, please include it with your message.